Symptoms of Spinal Injury in Rabbits. Spinal cord injury treatment in rabbits with injured or broken backs - how to know if there is hope for the rabbit’s survival. Rabbits are surprisingly susceptible to broken backs. Broken backs occur for two reasons -- mishandling, or a sudden startle for reasons clear only to the rabbit. Being prey animals, they are timid and startle easily. A sudden frightened kick with its hind legs is all it takes to snap the rabbit’s backbone and render it paralyzed. This happened to one of our excellent breeding does. On the night she kindled her third litter, unbeknownst to us, something startled her in the barn. When we checked on her and her kits in the morning, the kits were hungry, and she was propped up on her now-useless hindquarters. The story does not have a happy ending for we had to euthanize this doe. Her bladder and bowels were no longer functioning, and her hind end was fouled with incontinent urine and feces. She was at risk for infection and fly strike. Inability to urinate or defecate by itself (broken connection of the nerves to the brain due to the break in the spinal column). If lifting the front end of the rabbit (or a gentle pressure to the lower abdomen) causes a flood of urine, this is an indication that her bladder no longer functions correctly. If her stools turn to mush or she is not passing any feces, this is not good. Not too long ago as we fed the rabbits, we noticed one doe acting strange. Where she usually hopped right up to the cage door to say 'hello,' that afternoon she remained at rest. When she did move, it was very slowly and with guarded movements. We noticed the normal hunch of her back was all wrong. Instead of a nice rounded curve up and over her hindquarters and down to her tail, she was letting her belly and back sag, even when at rest. We believed she injured her spine, but without severing her spinal column. Happily, in a week or so, her posture had corrected, and she acted normally once again. 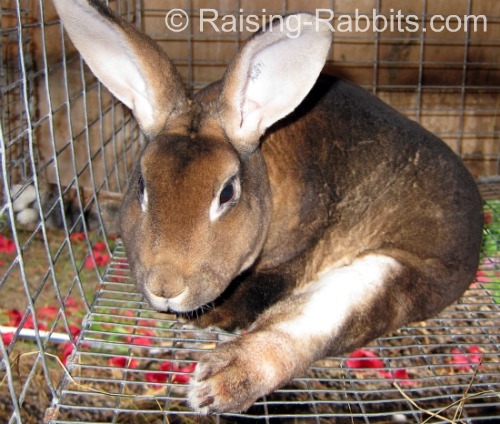 Immobilize your rabbit very carefully in a very tight rabbit carrier for several weeks, to see if any function returns. Place the rabbit in normal upright resting position, with feet underneath it, in a bed of hay. Pack the hay on the sides of the rabbit as well - think of it as a ‘hay cast’ instead of a plaster-of-paris cast. You’ll need to check the rabbit’s hind end every day to ensure it stays clean. Any loose stools need to be cleaned away from its undersides and out of the carrier. 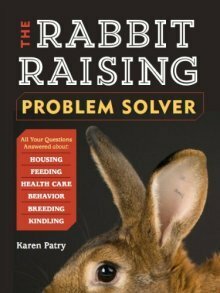 Failure of your rabbit to urinate and defecate on its own is a strong argument for simply euthanizing the animal. If after a few weeks there is no improvement, the usual next step is to euthanize the animal. At Aurora Rex Rabbit Ranch, we've had three rabbits break their backs. One rabbit was mishandled by guests to the barn, and the other two rabbits startled at night for unknown reasons. In all cases, we chose to euthanize the rabbits, because the broken backs had also broken the spinal cord. Good luck. We hope you never discover any symptoms of spinal injury in your rabbits.